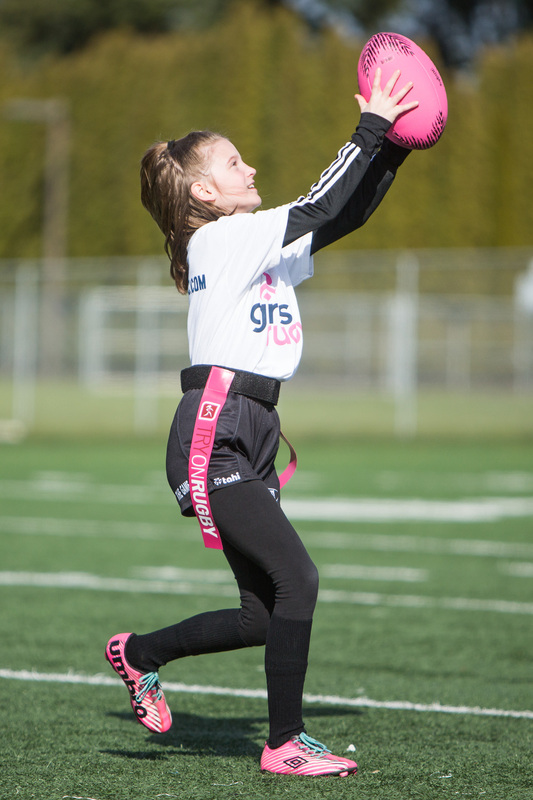 Girls Rugby provides access for girls to learn vital skills and core values such as leadership, empowerment, achievement, respect and sportsmanship all while enjoying the experience of playing all-girls, non-contact rugby. Girls Rugby embodies the philosophy of developing young girls through sport and understands the positive benefits that participation in team sports has on their lives. Across grades 3rd-12th in the U.S., there are 4 million less girls participating in sports compared with boys (Womens Sports Foundation, 2011). Additionally, by the time girls are in high school, 1 in 4 will never have participated in organized or team sports (Sabo and Veliz, 2008). Even for the most active girls, there are still only 26% that participate in physical activity six to seven days per week. Compared to boys (40%), that number is drastically low (Sabo and Veliz, 2008). Studies have shown that when girls participate in sports, their lives are positively influenced both on and off the field. Not only does participation in sports instill crucial life skills such as teamwork and good sportsmanship, but also decreases negative health risks such as breast cancer and obesity. Participation in sports also increases academic success and the likelihood of high school graduation. When we break this down into a sport-specific environment, these numbers are even lower. As of 2017, there were just over 28,700 females registered as rugby players with USA Rugby (25% of the entire USA Rugby membership). Of this number, only 1,055 play flag rugby under the age of 13; over 3,000 less than their male counterparts. The opportunities offered consist of co-ed non-contact programs and co-ed contact programs. Girls-only programs are few and far between, causing girls to drop out of programs or not join all together. At Girls Rugby we strive to provide a safe, fun and learning-focused environment designed to engage and support young girls as they go through crucial points of their development. Every week, girls will receive instruction on flag rugby and life skills. This type of approach helps girls become better rugby players on the field through their exploration of values like teamwork, leadership, respect, and sportsmanship. Girls Rugby athletes will see these values translate to their life in school, at home, and socially as well. This curriculum is designed to help girls to be more confident in themselves and grow up to make a positive impact on the world. Our qualified coaches will receive continuous support and education on delivering this unique curriculum. Our brand aims to inspire, empower, and redefine what rugby means for young girls. Every piece of our brand is designed to make girls want to pick up a ball and take a chance on rugby. Our brand will show the heart and souls of our coaches and referees, helping to inspire more women and men to pick up a whistle. We are incredibly passionate about what it means for females to be active and become leaders; this is the Girls Rugby brand. We believe in equipping our coaches and referees with the tools they need to be successful. Girls Rugby will provide consistent support and education, as well as useful resources. Additionally, each Girls Rugby coach and referee will be a part of a mentorship program that gives them the platform to share, learn, and collaborate throughout their careers. Our organization is driven by females and for females. While we embrace the involvement of males who believe in our mission and are aligned with our values, there is a strength in our all-female leadership at the top of the organization and within our Board. This aspect will help keep our key audience at the forefront of everything that we do.